Looking out the window of a music store in Lisbon, Portugal, I laughed out loud watching a passing parade of vintage convertible cars progressing along Avenue Liberdade. They were filled with brides of all sizes, shapes and ages, dressed in all their bridal finery. The storeowner told me they were the Brides of St. Anthony, and it was part of the saint's feast day traditions He said the city hall traditionally hosts the bridal couples for free if they are poor. I was in Lisbon to celebrate the Feast of St. Anthony and had begun the day by attending Mass at his church. I made my way slowly through the crowd to the front altar and found a golden and crystal reliquary on display. On closer examination, I noted that some sort of bone was inside. I later found out that this was part of the saint's right forearm. In the front lobby of the church was a small gift shop, but what really caught my eye was a group of women selling little bread rolls about the size of golf balls. People were pushing and shoving to make their purchase. As I watched, I noted that many of the women went back into the church and pressed the bread against a glass covered portrait of the saint. Then I noticed that several women were scribbling little messages on slips of paper, folding them up and sticking them into the frame around the portrait. Naturally, I followed suit and wrote down a special prayer, dutifully folded it up and tucked it into the frame along with my bread ball. The tradition of 'St. Anthony's Bread' dates back to 1263 when a child drowned in the Brenta River near the Basilica of St. Anthony in Padua. The mother went to St. Anthony and promised that if her child were restored to life, she would give to the poor an amount of wheat equal to the weight of her child. Of course her son was saved, and her promise was kept. 'St. Anthony's Bread,' then, is the promise of giving alms in return for a favor asked of God through St. Anthony's intercession. Music enthusiasts eager to hear fado, the emotion-laden, dramatic music particular to Portugal are likely to find an image of Anthony right behind the fadista (singer) and instrumentalists. Fado came long after Anthony, but its major theme is nostalgia and longing for what is lost and for what has never been gained. Anthony fits right into this scene. Learning about, and taking part in, these wonderful customs was fun, and I left the church to see what else I could discover about St. Anthony. To say that Anthony left Portugal behind minimizes his ancestry. The man who became known to many as Anthony of Padua was Portuguese. He was a spiritual seaman, seeking new lands of the soul, just as other Portuguese explorers ventured into unknown waters. He had the broad world view of a discoverer and became a fearless missionary -- traveling first to Morocco and then through southern France and northern Italy on foot. While in Rimini, on the Adriatic coast of Italy, he encountered difficulty in getting the local population to listen. Somewhat dejected, he went down to the shore, where the river Ariminus runs into the sea, and began to speak to the fishes. No sooner had he spoken a few words when suddenly a great a multitude of fishes, both small and great, approached the bank on which he stood. All the fishes kept their heads out of the water, and seemed to be looking attentively on St Anthony's face; all were ranged in perfect order and most peacefully, the smaller ones in front near the bank, then the bigger ones, and last of all, were the water was deeper, the largest. As he continued speaking, the fish began to open their mouths and bow their heads, endeavoring as much as was in their power to express their reverence. The people of the city, hearing of the miracle, made haste to go and witness it. I had heard that sardines represented those miraculous fish and were an important part of the festivities, so I thought I'd have some for lunch. I went into a nice restaurant almost salivating thinking of the tasty fish. Alas, the mater'd almost sneered as he said they did not serve sardines there. I tried several other restaurants to no avail. It wasn't until the guy at the music store directed me down a small street lined with outside tables and a variety of small restaurants that I found them. They were proudly displayed in all their silvery glory in a refrigerated case. Needless to say, my luncheon was totally divine! It turns out that the opening of sardine season coincides with the Feast of St. Anthony, and all over the city people grilled them on every type of device. The fancy restaurants can't compete, and folks wouldn't pay their prices for this local specialty. The fame of St. Anthony's miracles has never diminished, and even today he is acknowledged as the greatest miracle worker of the time. He is especially invoked for the recovery of things lost. Also, against starvation, barrenness, patron of amputees, animals, boatmen, Brazil, diocese of Beaumont, domestic animals, the elderly, expectant mothers, faith in the Blessed Sacrament, Ferrazzano, fishermen, harvests, horses, Lisbon, lower animals, mail, mariners, oppressed people, Padua, paupers, Portugal, sailors, sterility, swineherds, Tigua Indians, travel hostesses, travelers, and watermen. St. Anthony is known as the matchmaker saint and on the Eve of his day, June 13th, girls try various methods of finding out whom they will wed. A favorite way is for a girl to fill her mouth with water and hold it until she hears a boy's name mentioned. The name she hears is sure to be that of her future husband! Another way to recognize 'the gentleman' is to make an agreement with St. Anthony by a sign or an object that only the two of you know about. * Place the bowl under your bed. The next day, look at the papers -- the name that has opened up the most is your perfect partner! Single women have been known to buy a small statue of Anthony and place (or bury) it upside down for a week, blackmailing him by placing him upright only after they have found a good husband. A charming custom of the day is for young men to present a pot of basil to the girls they hope to wed. Within the petals is a verse or message that indicates the young man's passion. Pots of basil are displayed on almost every balcony around the city and are often given as gifts with little verses invoking St. Anthony or of love and affection for the recipient. 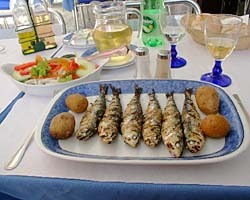 I discovered that the entire city celebrates St. Anthony the night of June 12 to 13th, with altars built, parades held and streets decorated, while the air is filled with the delicious smell of sardines being grilled at bonfires lining the street, especially in the Alfma district of the city. The biggest parade is the Marchas Populares, along the Avenue Liberade. Along with a few friends, I found an ideal viewing spot not far from my hotel and watched as countless marchers passed by. Every neighborhood in Lisbon has it's own contingent with colorful costumes, floats and marching bands. There is a prize for the best group, but as the parade continued past midnight, my friends and I got hungry and headed to the Alfama district for grilled sardines. We had been invited to a small neighborhood bar with a patio behind. There we were treated to beautifully grilled sardines on sliced bread served on paper plates. We drank sangria from plastic cups and licked our fingers as we reached for another fish. The bones piled up in the middle of our table and still the fish kept coming. I was in sardine heaven! Of all the beautifully prepared meals I had while in Portugal, this midnight snack is still the highlight.